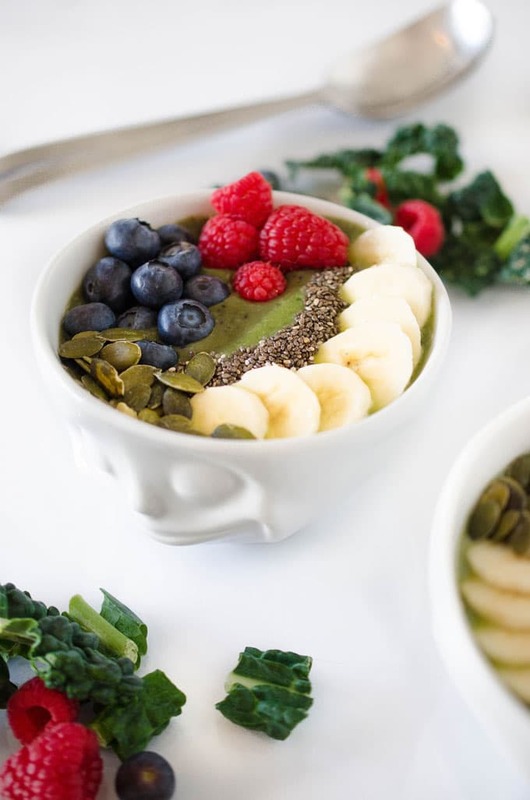 A healthy, two-toned super green kale smoothie bowl! Top it with fruit and eat with a spoon. Breakfast (in under 15 minutes) is served! The boyfriend-tulip-man and I have been on a breakfast smoothie kick since I moved in. He’s one of those people that I just do not understand in that he never usually eats breakfast. How can people not eat/like/love breakfast? By no means do I consider myself a morning person, but good golly am I a breakfast person. So obviously I had to mend this void in his life. And the solution? Smoothies. I’ve been whipping up green smoothies every morning in my sleepy haze. A handful of frozen kale or spinach, a pear, a banana, frozen berries, a dash of yogurt, a scoop of protein powder from the ungodly large tub he has stashed in our ungodly small kitchen, the works. Blend it up real quick and boom, breakfast for two + 1 serving of veggies + 2 servings of fruit taken care of before the sun rises. My love of smoothies quickly spilled onto the blog. 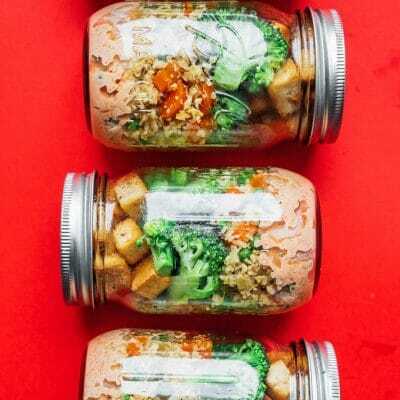 As of last week, all Live Eat Learn email subscribers will get a free, email-exclusive smoothie recipe with each newsletter! I send out the newsletter (eat-mail? yummail? what should I call it?) every Sunday with a roundup of the previous week’s recipes and posts + a peek into the next week + a FREE SMOOTHIE! No spam, no filling up your inbox, free smoothies. Sign up for the newsletter here! But recently I came across the concept of smoothie bowls, basically just thicker smoothies, eaten in a bowl with a spoon, topped with fruit. Something about eating rather than drinking my breakfast makes me feel more satisfied, so this has been THE breakfast discovery of the century. Or like, of this week anyways. 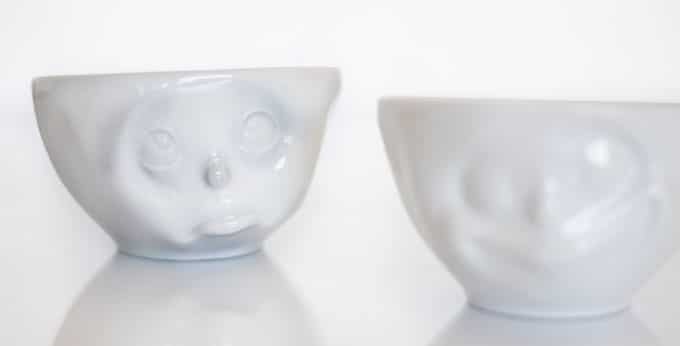 And can we talk about how spankin’ cute these bowls are? There’s a small shop in Germany that sells them, and for years we’ve gawked through the store window every time we walked by. Anyways, Santa brought them for me this year and I love them dearly. You can check out the whole collection here. But I digress. 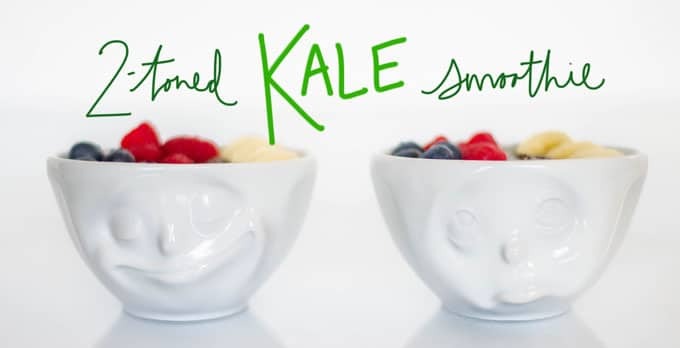 For these two-toned kale smoothie bowls you’ll basically just blend up a bunch of healthy noms, pour about half of the green smoothie into a cup, add blueberries to the reserve, and blend again, creating one green and one blue-ish/brown-ish smoothie (add more blueberries for a deeper color!). 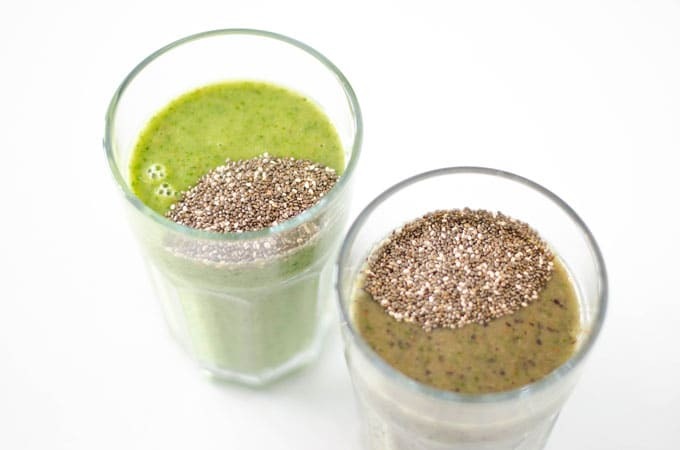 Chia seeds do wonders for thickening up liquids. We’ll add 1/2 Tbsp to each smoothie to make them nice and thick. 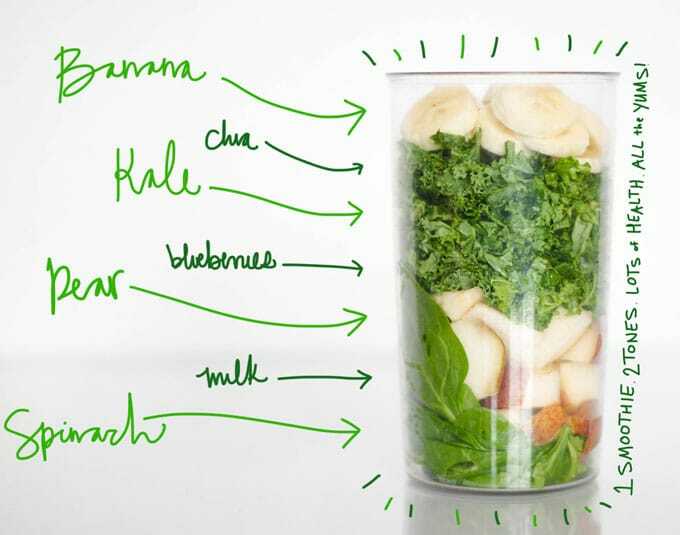 A healthy, two-toned super green smoothie! One half packed with nutritious greens and the other bursting with berries. Top it with fruit and eat with a spoon! 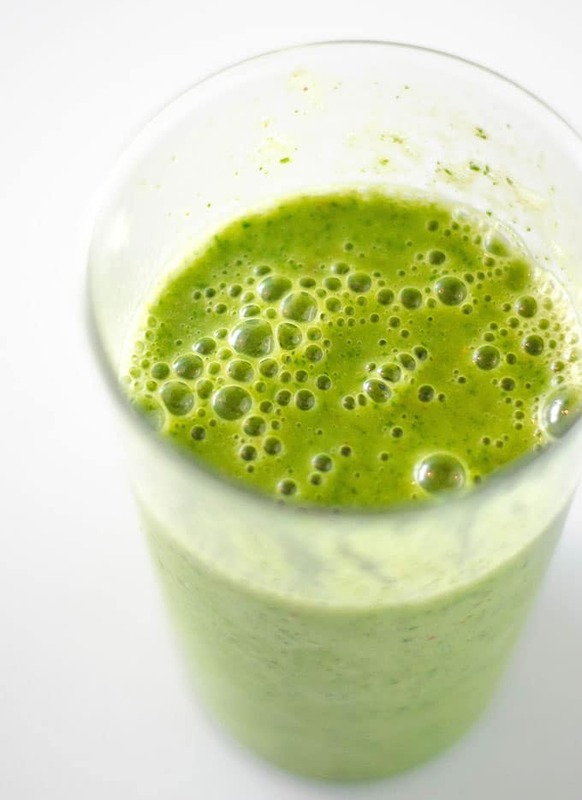 In blender, combine kale, spinach, banana, pear, and milk until smooth, adding ice if you’re not using frozen fruit until you reach a consistency of your liking. Pour a little more than half of the mixture into a large cup or bowl, leaving the remaining half in the blender. Add blueberries to blender and combine until smooth. Pour blueberry mixture into a separate large cup or bowl. 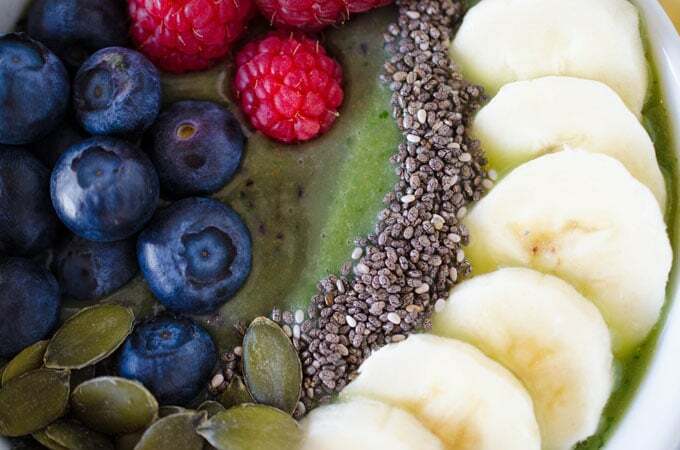 Add ½ Tbsp of chia seeds into each smoothie and stir well. Let chill and thicken in refrigerator for about 15 minutes. Slowly and simultaneously pour each of the smoothies into a bowl, pouring into opposite sides of the bowl to create a two-toned effect. Makes enough for 2 medium-sized serving bowls. Top with fresh sliced fruit, nuts, and seeds. *Be sure to remove peel from banana and chop into chunks before freezing. This post contains affiliate links, which means if you purchase something after clicking a link from this post, I may receive a commission at no extra cost to you. 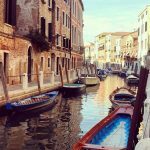 Affiliate links help me to make Live Eat Learn possible! 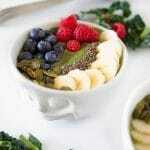 I love smoothie bowls and this one sounds like no exception! This looks ands sounds absolutely divine! I’m afraid I fall into the camp of boyrfriend-tulip-man. It’s not that I don’t love breakfast food – I do – I just can’t stomach it in the morning. I’d much rather have a stack of pancakes for dinner than before work. 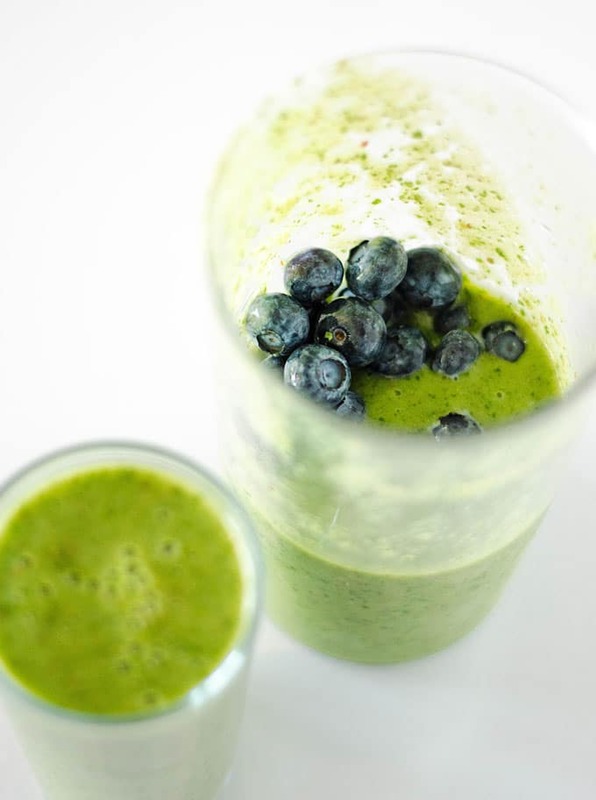 Smoothies work well for me though so this recipe is right up my street. Must try to chuck more veggies in them! Great post. Oh my word! That looks amazing. Perfect for breakfast or as a light snack. YUM! Breakfast should never be skipped…. I just bought a new blender to make smoothie…thanks for sharing this! I’ve also been on a total smoothie kick. These look amazing! 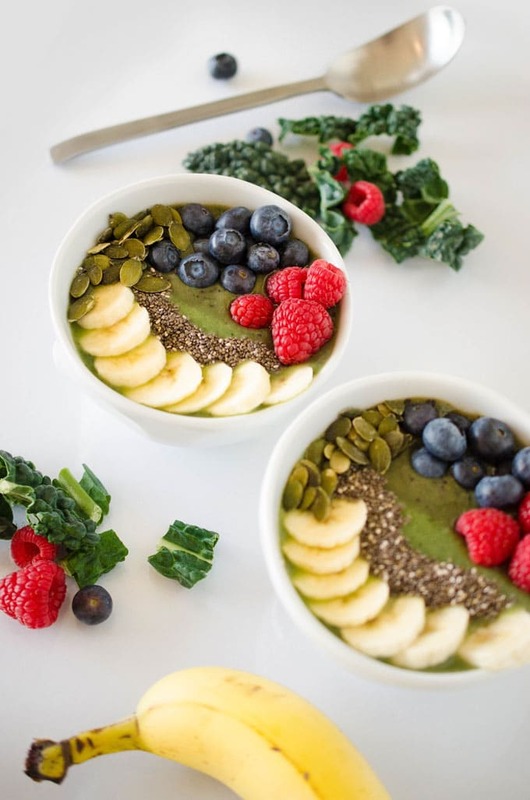 Those smoothie bowls look amazing! I can’t wait until it’s blueberry season. I’ve blended grapes in smoothies before and was left with skin, do blueberries do that? Great idea on how to achieve that 2 tone. It looks deliciously healthy. I’m a little late to the game, but I just recently started getting into smoothie bowls! This one looks so delicious and nutritious! Right?! 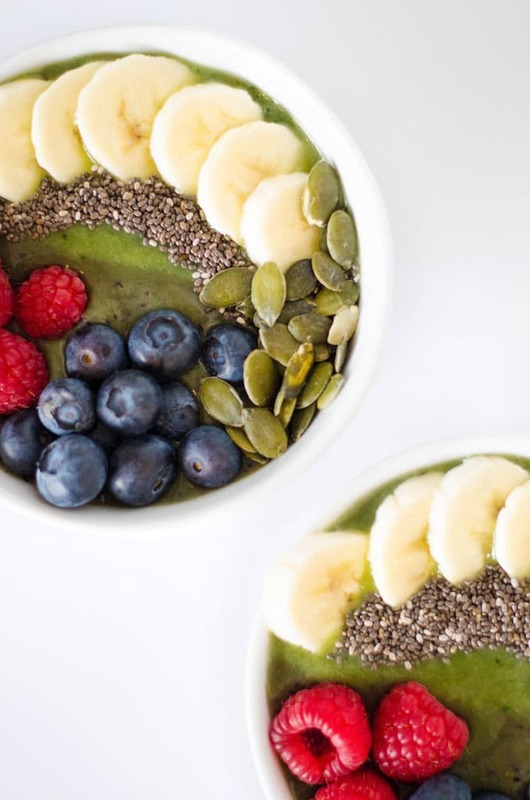 How did we never know smoothie bowls were a thing! They’re perfection! Oh my word these look god. I never thought of putting a thicker smoothie into a bowl like that. Great idea! And yes, the bowls are adorbs. What a great idea!! My family and I drink a kale smoothie every morning. Sometimes they come out quite thick! This would be a great substitution! 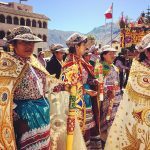 Thanks for this post!!! Yes this would be perfect for you! And sometimes I just get tired of drinking breakfast, so this is a happy halfway. Yum! So pretty! I love smoothies and especially smoothie bowls. Love getting to load them up with yummy stuff. This looks so beautiful and colorful and cozy and totally delish! How gorgeous is this for a wonderful start to the day! YUM! Thanks for sharing! Well doesn’t this look delicious! I have some extra kale in the fridge that I was hoping to juice…but I love that this is an easy and tasty way to kick off a new day! This looks absolutely delish! I love kale smoothies but have yet to try a two toned one! Thank you for sharing this recipe! I pinned this…Yum! I need those cute bowls, too! Wow, what a range of color! This looks fantastic! Your pictures are great. I drink a lot of smoothies but I have never done a smoothie bowl, I’ll definitely give this a try! Thanks, Lezley! Yes you’ve gotta try it! With fresh fruit and yummy toppings…life changing! I bet the pears make this tastes so good. This is a great idea. I make a version of your Nice Cream with frozen bananas and frozen spinach. 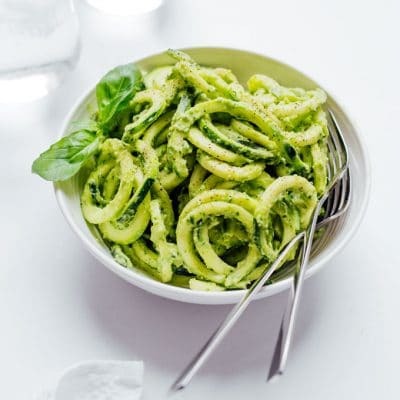 I know that sounds terrible, but the spinach really adds no taste and you can put in a bit of sugar free flavoring if your sweet tooth is acting up. This comes out thinner than Nice Cream and more like thick oatmeal. I just never thought to coat the top with fresh fruit. Thanks for the nice idea. Oh and those bowls are cute. Topping the smoothies really makes them feel so much more like a meal!